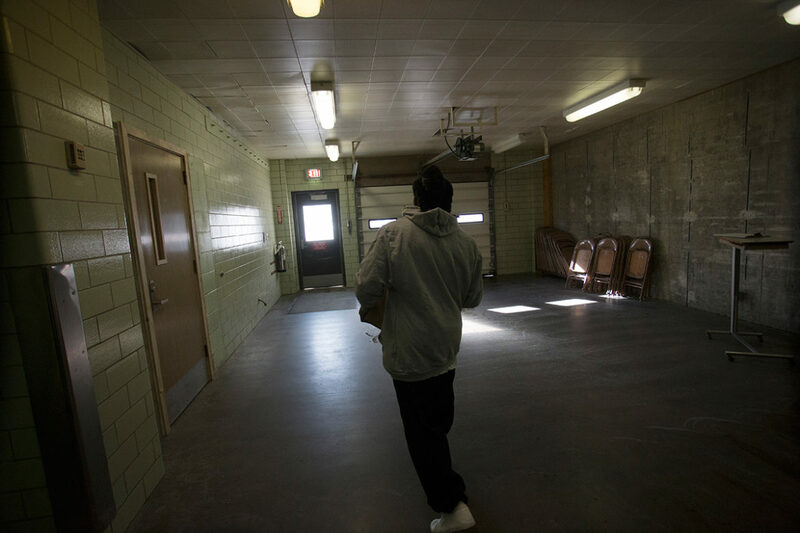 An inmate prepares to leave East Moline Correctional Center in this photo from 2015. Banning "the box" would make it easier for those with criminal records to get a college education. When Ashor Jajou was released from prison after serving a year for drug and weapons possession, he thought college attendance might help to ease his parole restrictions. So he applied and was accepted to Northeastern Illinois University. Jajou, whose family emigrated from Iraq when he was a child, had avoided school as an adolescent and young adult. But he excelled at Northeastern. He became a leader in campus and community organizing, and served a stint as student government president. Now Jajou, who has multiple degrees in social work, works at Curt’s Café, a non-profit organization that provides training in food service and life skills for young people in Evanston. A one-time gang member himself, Jajou describes the young men he works with as “much like my former self” and promotes college as a possible, and potentially positive, life pathway. But Jajou knows that one challenge facing youth who have criminal records is “the box”—not on job applications, but on college applications. While efforts to “ban the box” asking about criminal records on job applications have gained widespread publicity, related initiatives to do the same on college applications have yet to gain broad traction. “The box” on college applications has a disparate impact on African Americans and Latinos, who are a disproportionate share of the estimated 70 million people in the U.S. who have a criminal record. Northeastern, along with City Colleges of Chicago, doesn’t ask about criminal record on its application. But other local universities and colleges, and many nationally, use the Common Application, or “Common App.” It’s popular among both applicants and schools because it’s easy to use, convenient and affordable—fill it out once and your paperwork is good for every school you want to apply to. Yet the Common App, and other application forms, reinforces discrimination with questions such as Have you ever been adjudicated guilty or convicted of a misdemeanor, felony or other crime? Have you ever been arrested? Have you ever been convicted of a felony or have felony charges pending against you? The Common App even delves into school discipline, asking whether an applicant has “ever been found responsible for a disciplinary violation” in school. Depending on the school, a violation could involve an exceedingly minor infraction such as being suspended for talking back to a teacher or not wearing a school uniform. Research has shown that black and brown students are far more likely to be disciplined, even for the same low-level infraction, than white students. Neither criminal records nor school discipline are race-neutral, and having such a record requires an applicant to check “yes” to the box—potentially flagging their application for rejection. Colleges and universities are more likely to deny or revoke admission if an applicant is found to have a criminal history. Do we really want to discriminate against young people of color and deny them the chance at a college education based on the box? However, there is no evidence to suggest a connection. “No link has been established between having a criminal record and posing a risk to campus safety” according to a 2015 study conducted by the Center for Community Alternatives, a New York-based public policy organization that examined the use of criminal history records in college admissions. Other experts point out that providing access to college actually promotes public safety. Just ask Steven Czifra, director of the Underground Scholars, an initiative at the University of California at Berkeley that aims to support students who have been incarcerated. Not only does the box provide a rationale for colleges to reject prospective students, but it deters many with records from even applying. The Center for Community Alternatives estimated that, throughout the entire State University of New York system, applicants who disclosed a previous felony conviction had an application attrition rate of 62.5 percent—or, put another way, of the 2,924 applicants who checked the box, 1,828 never even completed the application paperwork. Despite clear evidence that the box deters applicants and pushes people away from education, nationally and in Chicago, institutions of higher education continue to rely on the Common App. Our research indicates that most Chicago colleges and universities, (excluding City Colleges and Northeastern) do so and ask about criminal history, including Columbia College, DePaul University, Loyola University, Northwestern University, School of the Art Institute, University of Chicago and University of Illinois at Chicago. These institutions lock out too many young people who want and need a college education to succeed. Nationally, efforts are underway to ban the box on all college applications. In May 2016, U.S. Secretary of Education John B. King, Jr. issued a “Dear Colleague Letter” asking colleges and universities to reconsider how information about criminal history is used in the application process. Bowing to pressure, the Common App also recently announced it would eliminate the ambiguous phrase “other crime” from the question Have you ever been adjudicated guilty or convicted of a misdemeanor, felony or other crime? But that question itself, as well as the question about school discipline records, would remain. College students are organizing too. With sit-ins and other organizing tactics, the New York-based Incarceration to Education Coalition is pushing institutions such as New York University to remove the box and for institutions to pressure the Common App to remove all questions related to criminal and school disciplinary history. College and university students in Illinois are slower to the gate, though some efforts are underway among student groups in Chicago to organize against mass incarceration by pushing institutions to divest from private prisons and companies that supply them. While no campus in Illinois is currently running a “ban the box” campaign, formerly (and currently) incarcerated students are getting organized. At Northeastern Illinois University, the student group Formerly Incarcerated Students Together started in 2015 to support students with records. FIST has organized events, panel discussions and film screenings, including a spring 2016 standing room only panel discussion about prison reform with three recent graduates – all formerly incarcerated. Gov. Bruce Rauner has publicly called for a 25% reduction in the state’s prison population in 10 years. Access to high quality public education is part of the movement to end our state’s costly reliance on imprisonment. The box is part of the problem, not the solution. Erica R. Meiners teaches in women’s and gender studies, justice studies and educational studies at Northeastern Illinois University. Pedro Nungaray is a graduate student in the political science program at Northeastern. Sarah Ross teaches at the School of the Art Institute. All are involved with the Prison + Neighborhood Arts Project.